In this interview, Alexa Bradley, organizer, facilitator, and popular educator discusses the arc of the Great Lakes Commons: an ambitious and highly collaborative commons-based initiative. Alexa calls this work a grassroots effort unlike any other she has previously been involved with: “I’ve done this kind of work for roughly 25 years, and the power of the Great Lakes to tap people’s passion is just amazing.” Led by a growing network of leaders throughout the region, the cross-border, grassroots effort aims to establish the Great Lakes as a commons and legally protected bioregion. Read more at Commons Magazine. 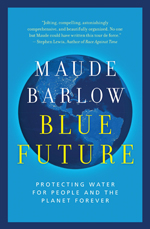 The final book in Maude Barlow’s Blue trilogy, Blue Future: Protecting Water for People and the Planet Forever is a powerful, penetrating, and timely look at the global water crisis — and what we can do to prevent it. Principle One:Water Is a Human Right chronicles the long fight to have the human right to water recognized and the powerful players still impeding this progress. Principle Two:Water Is a Common Heritage and Public Trust argues that water must not become a commodity to be bought and sold on the open market. Principle Three:Water Has Rights Too makes the case for the protection of source water and the need to make our human laws compatible with those of nature. Principle Four:Water Will Teach Us How to Live Together urges us to come together around a common threat — the end of water — and find a way to live more lightly on this planet. This post was written by 'noise of rain' on September 8, 2013. Read the original here. As the Water Walkers spoke in hushed tones around the sacred fire, our Letter to Water was reflected in the lake before us. Across the lagoon were the gathering tribes, watching our messages, while hearing the water song. WATER, WE LOVE YOU. WE RESPECT YOU. WE THANK YOU. It was pretty hectic, changing words out in real time, running to the van to get the next letters, and it didn't go without a hitch when the tail of the "R" wouldn't turn on and somehow PAY FOR WATER didn't seem an appropriate substitute for PRAY FOR WATER. And then, with a frustrated punch to the battery box, we were back in luck with PRAY. The little stagehand dramas of our funky alphabetic constraints are never seen from afar, and in spite of our struggles the view was stunning: Grandmother Mandamin and her sisters in a circle around the sacred fire, the large teepee gently lit and standing stable behind them, offering a focal point as the purple void of Lake Michigan whispered her way into the velvet night. We held our messages, and packed up the lights quickly. Hectic. We had only a few minutes before the fire canoes came across the lagoon, and the vans were waiting to take us back across the shoreline to the access road that reconnects the park to the mainland. We watched the impressive Indian Summer fireworks safely from the shoreline, thumping our chests like CPR and blossoming over the night sky. So much commotion! One of our Holders of the Light, Peg, came up to me in hushed tones, said to me that she was so honored to be in the company of a woman like Grandmother Mandamin. I suggested that she go tell the elder that, tell her that we all admired her tenacity and heart and that we were inspired by her walks down the St Lawrence Seaway, around the Great Lakes, exchanging waters, gathering waters, talking water as she went. I could see Peg talking to the Grandmother, and a beautiful thing happened: a blessing, a benediction, a gentle tickle of the breeze from a set of eagle feathers shaped an envelope of air around Peg, while at the same moment, as she told me afterwards, shivers went up and down her body. The walk is spiritual, is actual, is political, is environmental. There is video of this lovely woman, this elder who is old enough to be enjoying a rocking chair and birds at the bird feeder, and in it she shuffles down the road, feet close to the ground, oddly reminiscent of indigenous dance that I see at the powwows. She carries a pail - water from the ocean, water to mix in the beautiful freshness of Lake Superior. Water from one basin to another, a gathering of molecules, of thoughts, of people, of tribes. So when we were asked to be a part of this ceremony for water, we didn't hesitate. We didn't understand that we'd be standing by a woman who walks, but we knew that we are thirsty to stand for something meaningful, to light some messages reflected in water, to water, about water in the dryness of the oncoming night. I laughed at the irony of the broken tail of my letter "R," as I struggled at the site of the sacred fire to turn PAY FOR WATER into PRAY FOR WATER. We didn't quite have time to get the Water Song right, but nobody cared, it was still beautiful. So tell me. Yes, you! Have you walked around any of the Great, or even lesser, Lakes recently? You know, you can start right outside of your door, and like water, move until you get somewhere deeper.